During my run from Vallejo to the KKMI boatyard in Pt. 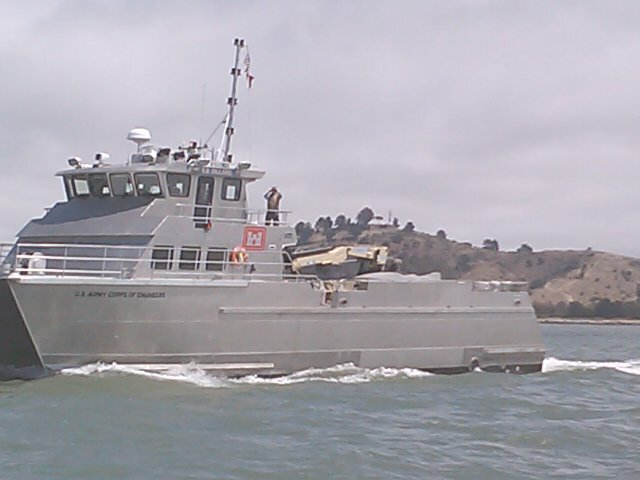 Richmond, "ran into" this Army Corp. of Engineers catamaran today, three times. First time, I was going south in Mare Island Strait while it was going north. Then it passed me in the western part of San Pablo Bay, Third time it was exiting Point Potrero Reach while I was entering. Last I saw the craft it was heading in the direction of central San Francisco Bay. The boat was making at least three times my 6.3 knots. Thanks, Craig! Saw no debris, and doubt the vessel spent little if any time picking up debris today. Regardless, at least some of the crew was friendly (took a picture of us, waved at us). And, the boat's wake was mild! How did your Richmond run go today, Mark? Is the Coot on the hard? Could have been a search pattern for reported debris??? Largely uneventful. Lot's of spray from the chop (the Coot is a wet boat), facing the wind with tidal current pushing us into it. Quite cool air temperatures, and lots of cloud cover during the morning. Engine time was exactly three hours. Left the Coot tied to one of KKMI's floating docks. Rest assured, it will be on the hard for at least an inspection, as ordered. (And probably more for unseen/unknown repair and maintenance.) Most work will be engine and paint maintenance. Thanks. Already identified. Seems to be a common issue of Coots. Hull #5 had that problem also.